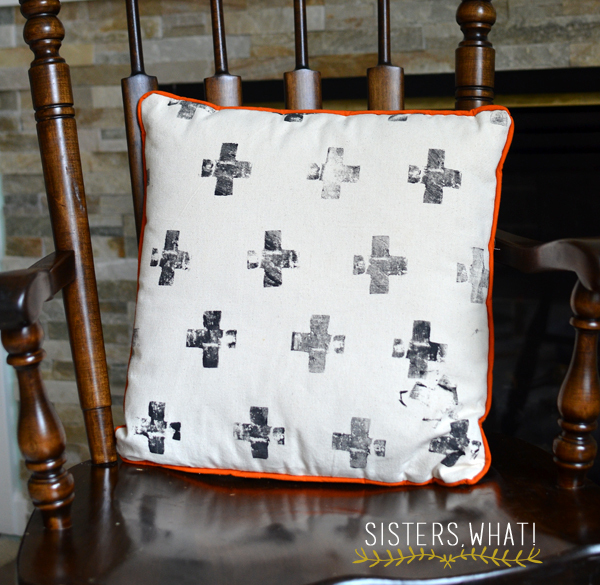 ' Potato Stamped Plus Sign Pillow sewing - Sisters, What! 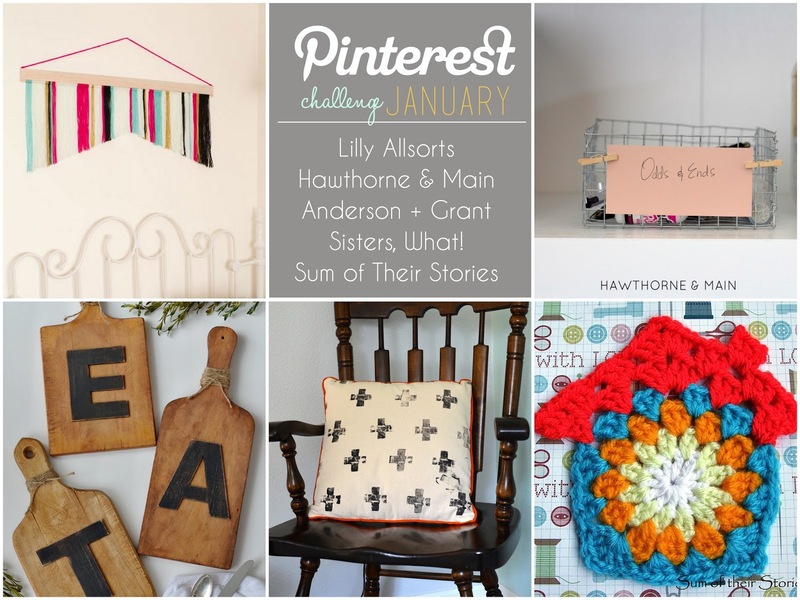 One of my new year goals this year was to start tackling the projects from my pinterest boards. To make this goal doable, I decided to complete at least one project a month. To make it even more fun, there are a few other bloggers joining me (see below). 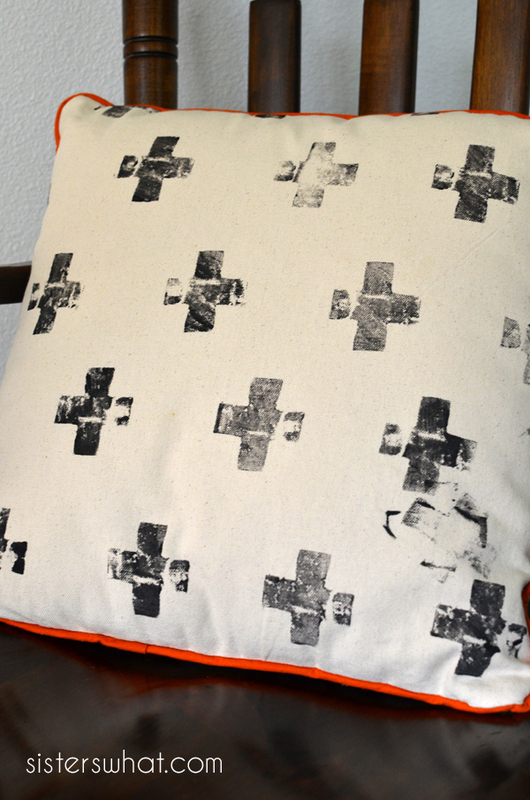 My project for this month was a potato stamped pillow. I saw this plus sign pillow and just had to give the potato stamping a try. I was kind of nervous at first, but it was really fun and easy. Plus (no pun intended ; ). I really liked the imperfect look of the stamp. Captain Awesome wanted to help and we had a little mishap in the corner of the pillow case, but it kind of adds character. I really wanted the piping for the added color, but I was super lazy and didn't want to make a trip to Joanns, so I found this great tutorial about using yarn as piping. It was totally genius and worked! cut out your desired paper design (make sure it will fit onto your potato cut in half). Place on half of of the cut potato (the inside wet part) and whittle around the design until you have a stamp. 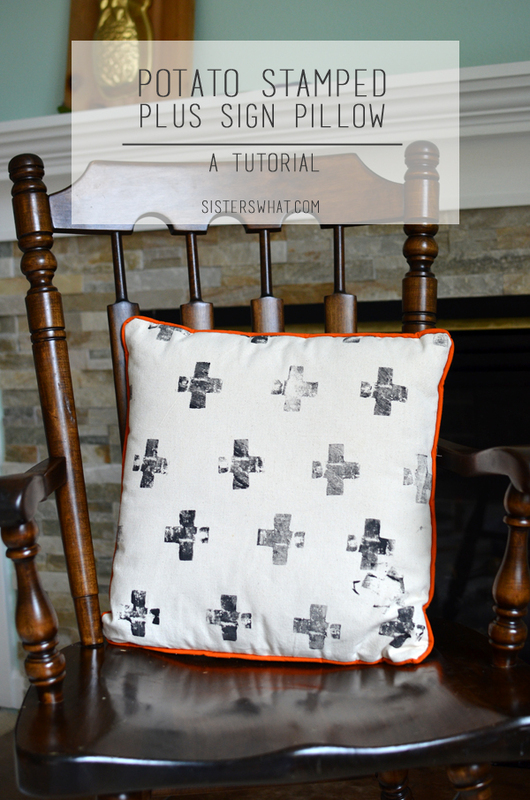 dip your stamp into the paint and stamp onto your fabric. For the pillow part, I found a post on creative living about yarn piping and had to give it a try. I was quite pleased with the result. 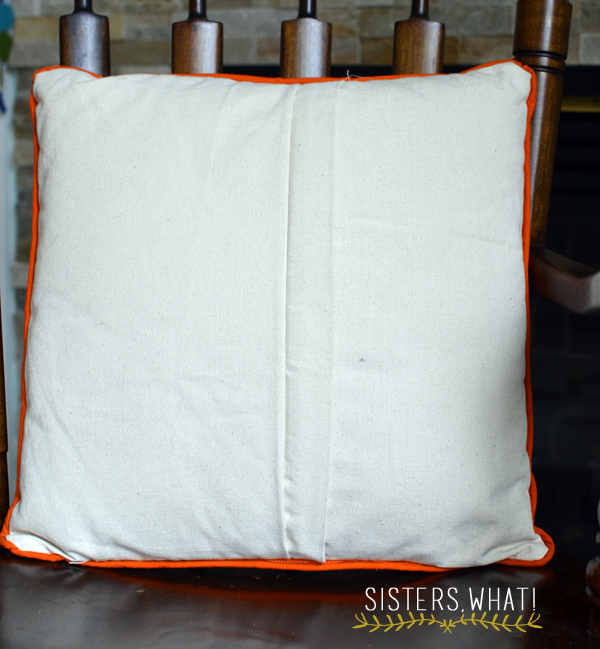 I usually do a simple envelope pillow, but I thought I'd try out Sew, Mama Sew's tutorial on zipper pillows. I highly recommend the tutorial, it was really easy and the zipper is completely hidden. *If you're a blogger and interested in joining in the monthly challenge email me at: sisterswhat at gmail and I'll send you a link to our facebook pg. I love how it turned out! I'm still stealing away little moments to work on my pinterest project. The little finds it entirely too fascinating! Love this Havalah! Great Job! Also, the wool as piping? Amazing! So need to learn that! I haven't tried potato printing since I was at school, it's looks really fun. I even love the little mishap! This pillow is fabulous! I love having things like this to throw on a chair or the couch. Using a handmade potato stamp is a neat idea because then any design could be made. And I'm totally going to have to check out that tutorial for the yarn piping. I never want to make piping because I'm too cheap to go buy it....but I've got plenty of yarn :) Thanks so much for including me in this! I love this idea! I've been wanting to make reusable gift wrap for awhile. I think I'll potato stamp it! What a great idea! And I love this look. The pillow turned out darling and I do like that little extra character at the bottom. Thanks so much for sharing with us at Talented Tuesday. I hope you join us again next week. What a cute and easy idea!! LOVE this... at first I thought it was black duct tape! This is so cute! I never would have thought to use a potato to do this; SO neat! I love the red piping, too!